Bundi is certainly a must-visit place in Rajasthan as there is a lot to explore within its boundaries. For centuries, it had been the land of local tribes until it was under the control of Rajput kings of Mewar. Today, Bundi is popular amongst tourists for its historic buildings which have been standing strong narrating their legends for centuries. If you are looking for a historical trip not far away from Bhopal and in the state of Rajasthan, then Bundi is one of the few places which should be on your bucket list this season. So, how about a trip from Bhopal to Bundi to get your wanderlust satisfied? Read on to know more about how to reach Bundi and its tourist attractions. Being a part of Rajasthan, Bundi experiences an extreme type of climate and hence, summers are hot here. However, due to the presence of a beautiful lake and green surroundings, it can be visited during the summer season. Bundi remains a major tourist spot in Rajasthan throughout the year. If you do not desire to experience its hot summers, then the best time is from October until the end of March. By Air: The nearest airport from Bundi is in Jaipur at a distance of about 200 km. Once you have reached the airport, you can either take a cab or catch a bus to Bundi. By Rail: Bundi is well connected to nearby cities and towns by rail. You can catch a direct train from Bhopal railway station to Bundi Junction. By Road: Bundi is served with a good network of roads and hence, you can easily reach Bundi from Bhopal by driving. You must take route 1 if you are looking to reach your destination within minimum time. It will take you an approximate time of 8 hr to reach Bundi from Bhopal, i.e, 1 hr lesser than route 2. On your way, you can also take a break at the following places. Narsinghgarh is located at a distance of around 80 km from Bhopal and 320 km from Bundi in the Rajgarh district of Madhya Pradesh. It is popular amongst tourists for Narsinghgarh Fort which was the official residence of the maharajas of Narsinghgarh. As per records, this ancient town was founded during the 17th century by Dewan Parasram. Today, you can only find the ruins of the fort. Other prominent places to visit here include Jal Mandir, Nadiya Pani and Bada Mahadev Mandir. Kota is one of the most significant cities in Rajasthan and is located at a distance of about 365 km from Bhopal and 35 km from Bundi on the banks of the Chambal river. Once a significant part of the erstwhile kingdom of Rajput kings, Kota is today popular as an educational hub and one of the smartest cities in India. There are several places in Kota where you can learn a lot about its history. The major places include Jagmandir Palace, Seven Wonders Park, Chambal Garden, Umed Bhavan Palace and Kishore Sagar Lake. Finally, you will be on the lands of Bundi after covering a distance of about 400 km. 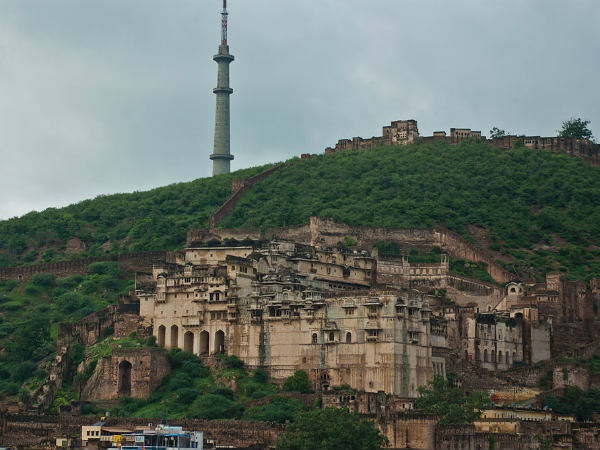 Being a historical city, Bundi is certainly a heaven for history lovers. From palaces to forts, there are myriad spots to be explored. Unknown to many, Bundi is also sometimes referred to as Chhoti Kashi, due to the presence of several temples. Following are the major places which you must not miss visiting while in and around Bundi. One of the most-visited splendours of Bundi, Taragarh Fort was built during the 14th century by the regional rulers to protect their city from invasions. Built atop a small hill, it overlooks the entire town and hence, from the top of the fort, you can capture the best frames of Bundi on your camera. The panoramic views of the town will certainly leave you awestruck. One cannot merely miss to visit this ancient marvel of Bundi. Another magnificent tourist spot, Bundi Palace is nestled beside Taragarh Fort and is popular for its intricately designed and beautifully painted murals, which attract each and every tourist. From ceilings to the walls and pillars to the arches, each and every part of the halls in Bundi Palace are adorned with drawings and patterns. Bundi is also well known for its ancient stepwells which are certainly masterpieces in the architectural world. Raniji Ki Baori, built in the 17th century is the largest of them all with a depth of 46 m. You can also visit Nagar Sagar Twin Stepwells, which showcase the flawless artistry of the craftsmen. Apart from all these places, you can also visit Nawal Sagar Lake, Chuarasi Khambon Ki Chhatri, Sukh Mahal, Phool Sagar, Kshar Bagh, Dabhai Kund, Jait Sagar Lake and Chogan Pol. Isn't Bundi a wonderful place with so many tourist attractions where you can learn, relax and rejuvenate? So, what do you think of a trip to Bundi now?